Like so many of our bodies systems, the immune system in wonderfully complex and intricately interactive, functionally protecting us from infection, disease and cancer. It’s primary components are composed of merging spheres of response, orchestrating automatic signals between; cells, organs, proteins, glands, bone marrow, blood, lymph, reactive actions, and physical, chemical, and biological barriers. As our immune system functions within the intersection of its two principle parameters of response - innate and adaptive immunity - we witness a display of memory for past events which helps activate the systems precision. Concurrently operating, is a cellular consciousness that has the ability to differentiate between all foreign substances, including bacteria, viruses, pathogens antigens, and cancer cells, from the normal cells of the body. Simultaneously, along with the aforementioned, there is an advanced activation of specialized immune cells, programmed with the innate capacity to respond to specific foreign materials. White blood cells develop in the bone marrow. These originate in the bone marrow but migrate to parts of the lymphatic system. There are two main types of lymphatics cells: T cells and B cells. 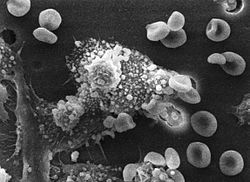 Natural killer cells destroy certain cancer cells. Plasm cells and B memory cells. Antibodies are released from the plasma cells. Cytokines: Messenger proteins - To communicate and share information, cells use chemicals. Cytokines regulate immunity, inflammation, and the production of white blood cells. The Complement System: is a biochemical network of more than 30 proteins in plasma. It promotes phagocytosis and regulates inflammatory responses. Acute Phase Reactant Proteins: are a class a plasma proteins that are important in inflammation. Its response is activated during critical illness. Acute phase proteins promote inflammation and stimulate phagocytes. Antimicrobial Proteins: Interferon produces antiviral proteins. There are more than 30 distinct antiviral proteins. Antibodies: are created in response to specific foreign antigens. An antigen: is a foreign substance that triggers a reaction from the immune system. A pathogen: is a microscopic organism that causes sickness. When invaders enter, the body cells are destroyed. The dying cells trigger an automatic response called inflammation. Immune cells: are white blood cells produced in huge quantities in the bone marrow. There are a wide variety of immune cells each with its own function.